In honor of Poison Prevention Week, the Missouri Poison Center has received many terrific posters created by kindergarten through 4th grade students. The posters all teach about poison prevention and keeping their families safe from poisoning. Help is a phone call away, as the artist draws in this featured poster. If you, like the young mother in the poster, find yourself asking “Is this OK?” then “Be Safe, Be Sure” and call the poison center. 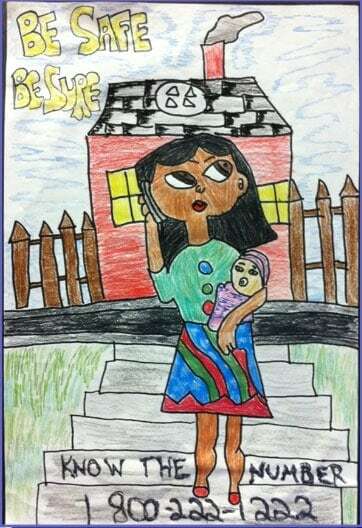 The fourth grade artist draws a baby in the arms of a modern young mother with her cell phone. There’s no doubt the mom has apps galore and high speed internet access. Many people today use the Internet or their phone apps when they have questions. Information is good, but for answers to questions about possible poison-ings, it is not good enough. If you think someone has gotten into something that might hurt them, call the poison center and find out for sure at 1-800-222-1222. Don’t try to guess whether something is poisonous. Don’t wait to see if symptoms start. Help is a phone call away and the specialist will answer your phone call right away. These experts are specially trained nurses, pharmacists and physicians and they will help you decide if the poisoned person needs to go to the hospital, or not. Most of the calls are handled at home with the help of the specialist. No question is too big or too small; just call. Here is ONE THING YOU CAN DO to celebrate Poison Prevention Week with us: Program the Poison Help phone number, 1-800-222-1222, in your phone. Having the number is crucial so you don’t waste valuable time trying to find it in an emergency. The hotline is free and open 24/7/365.